The IPMS Nationals was in Phoenix, Arizona this weekend. I was not in attendance though I have seen plenty of images shared on the internet by now. There were a lot of outstanding entries this year and one stood out to me in particular. It was an A-6 Intruder with an intricately detailed cockpit, tight weathering and a crap ton of bombs loaded on it. However, the bombs were painted blue yet each nose had a single yellow stripe. To the average observer, this is a meaningless critique but to someone who fancies their ordnance, it was a faux pas. 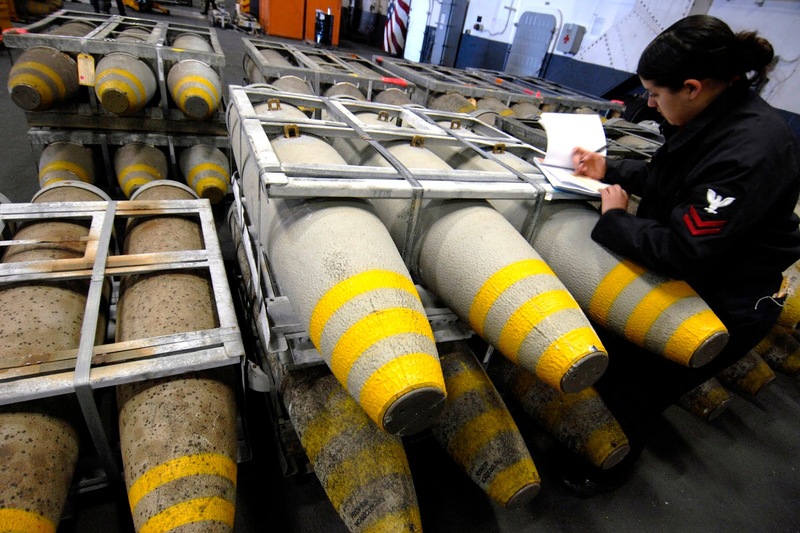 Believe it or not, the colors painted on various munitions have specific meanings. To understand them, I've created a basic outline for, at the vary least, ordnance of the United States. You probably cringe a little bit every time you have to mask the tips of your bombs to apply a yellow stripe around the nose. Tiresome and monotonous, yes, but it is important. Yellow markings denote the bomb is a high explosive hazard, or live as it were. If you have built air-to-air missiles then you should be familiar with the brown stripe that goes around it. The color indicates a low explosive hazard. 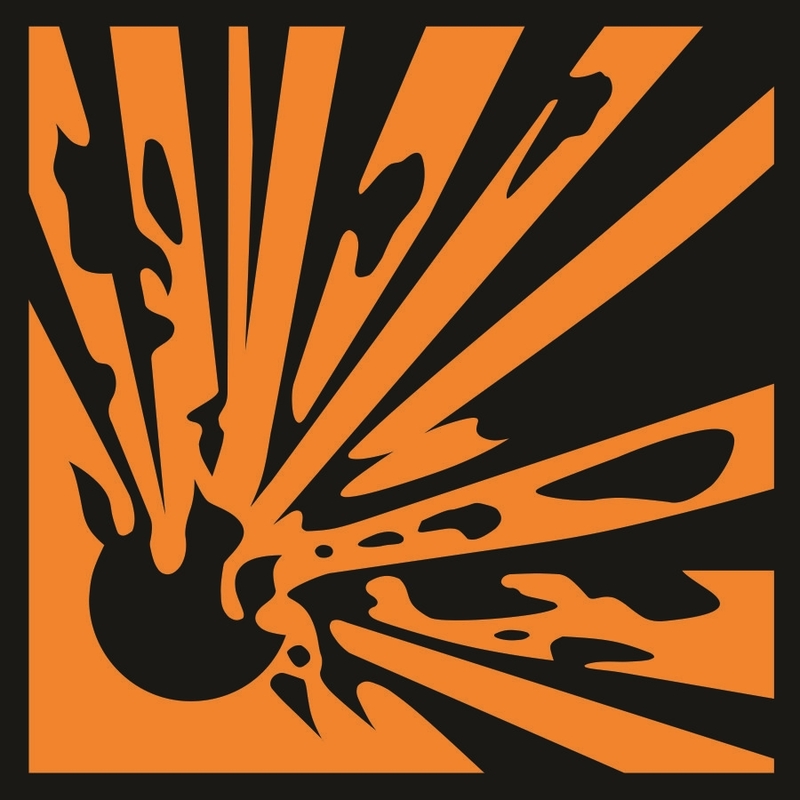 In regards to a missile, the low explosive hazard is the rocket motor. There are other places you may see brown which I will go over later. Not nearly utilized enough in the modeling world, blue indicates there is no explosive hazard and that the ordnance is inert. 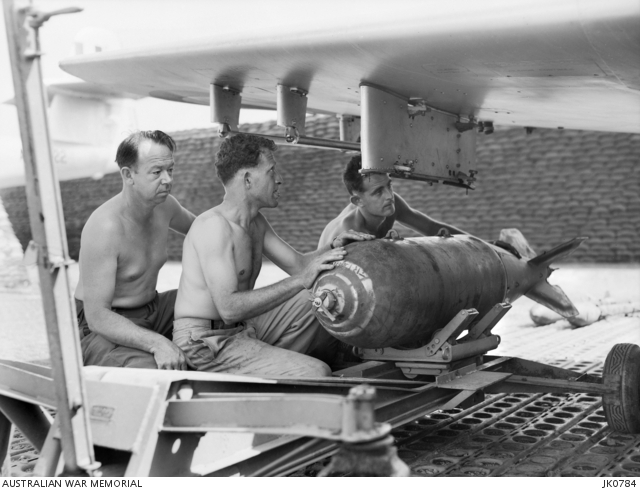 A modern aircraft spends the majority of its life hauling around inert ordnance. Not a color you see very often on today's ordnance but may be familiar to those who build Vietnam War era subjects. Red is indicative of an incendiary hazard and would most often be seen on napalm canisters. One of my blog posts would not be complete without photo references so let's dissect a few. Aerial bombardment hit its stride in World War II and the yellow stripe on bombs became a staple of aviation ordnance and a thorn in the side of modelers. The AN/M64 500 lb bombs below have a single yellow ring around the nose. Though you may also make out a ring around the mid-body and aft section as well on a few of them. During the war, a single ring meant the bomb had a TNT explosive filler. 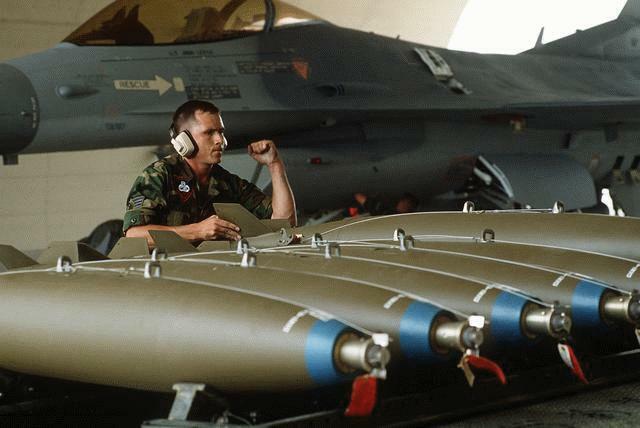 These bombs have a pair of yellow rings, forward and aft. Two of such rings meant the bombs were filled with Composition B. Look closely at the first two bombs in the photo and you can actually read the stencil. Also note how some bombs have complete rings while others are sectioned like a stencil. When a bomb was filled with Tritonal it was marked with three yellow rings. This remained true through Vietnam and it was not uncommon to see A-1 Skyraiders carrying AN/M series bombs with three rings. On today's bombs, the yellow ring remains the same though tritonal has replaced TNT and Comp B. A standard tritonal filled high explosive bomb will only have one yellow stripe. However, the Navy has a different set of standards. 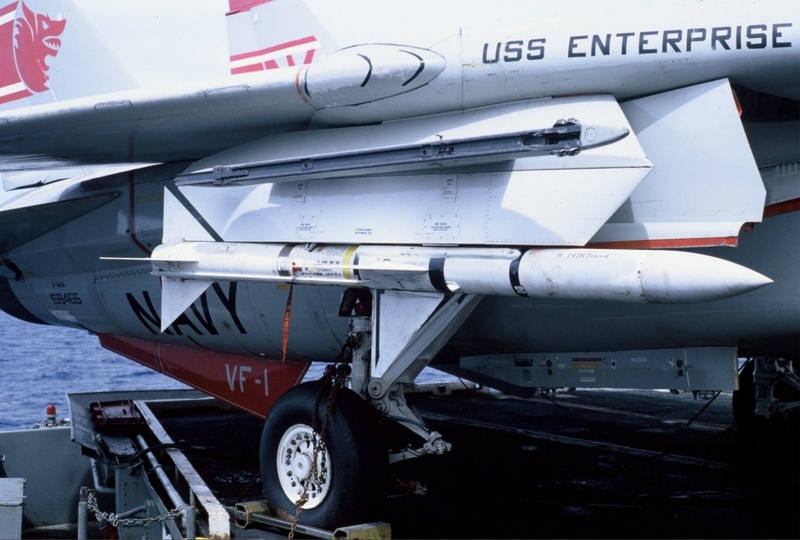 After the 1967 fire aboard the USS Forrestal, Navy regulations dictated that munitions had to be treated with an ablative thermal coating which would improve the cook-off time in the event of a fire. 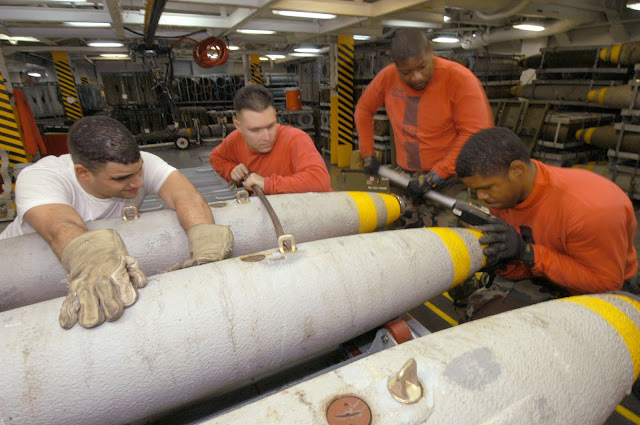 Therefore, post 1967 to present day shipboard munitions are painted with two yellow stripes - one to indicate the high explosive hazard, the second to indicate the ablative coat. 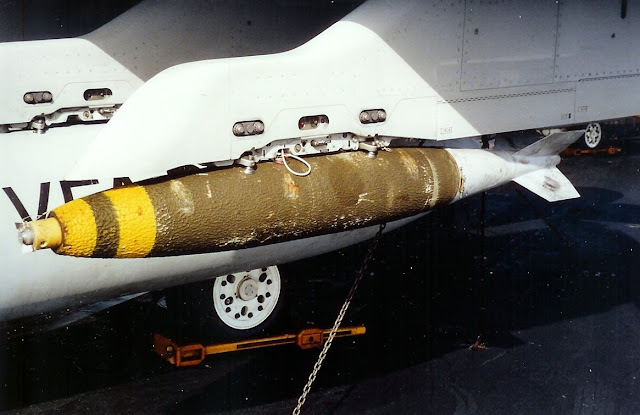 The thermal insulation is also recognizable by the rough textured appearance of the bomb body as seen below. More modern NAVAIR munitions that are thermally protected may appear gray instead of green as seen on the two striped Mk82s below. Though the NAVAIR Ordnance Safety Program required all munitions to be manufactured or refurbished with the ablative coating after 1967, keep in mind this was in the middle of the Vietnam War and ships were still at sea. 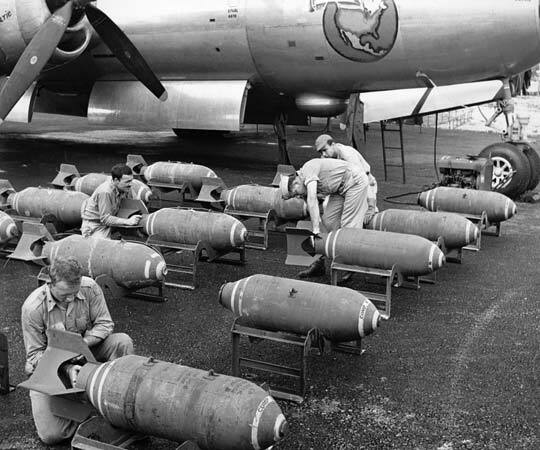 Aircraft carriers were forced to deplete their allotments of single striped non-protected bombs as the mission required. Therefore, it was not uncommon to see a mixture of one and two striped munitions on the deck. 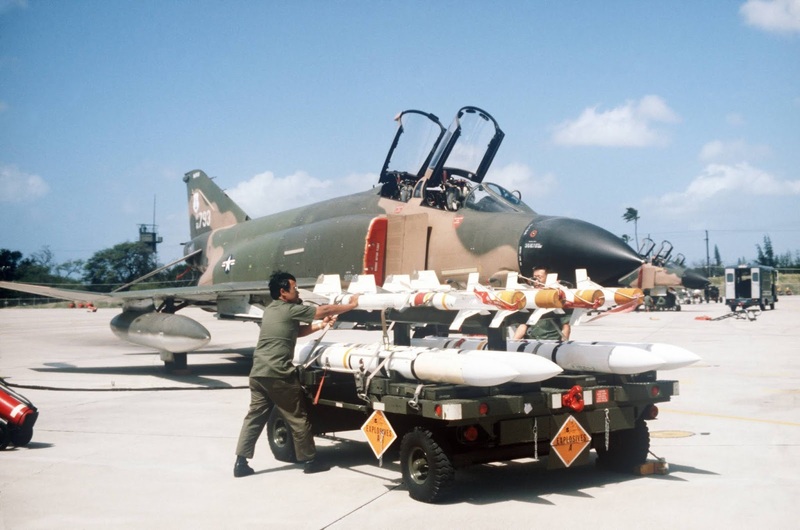 NAVAIR brought the third yellow stripe back when they started filling their bombs with PBXN-109. 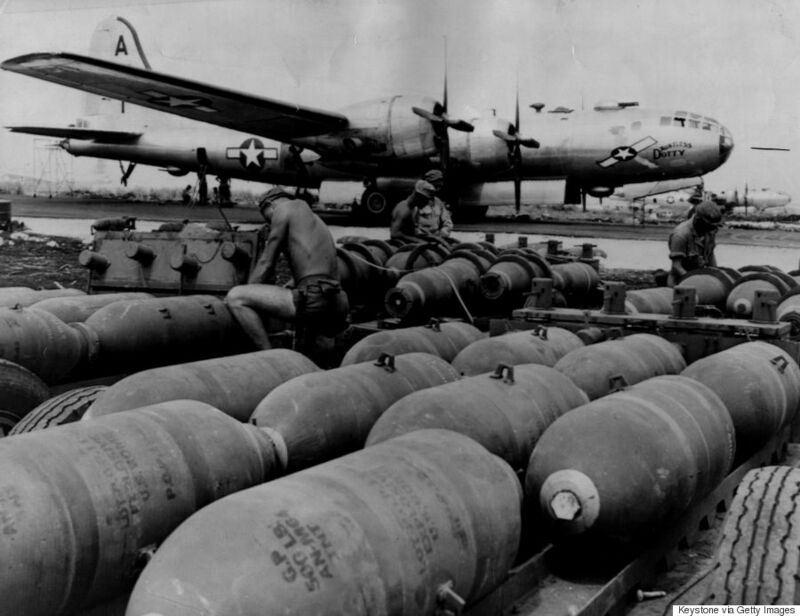 Note the sets of two striped bombs as well. Inert bombs are fairly straight forward. 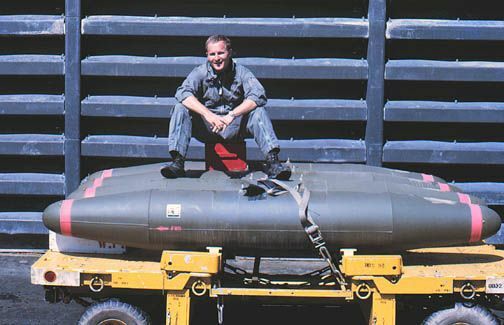 If the bomb body is completely painted blue, it means the munition is inert and is also approved to be flown and dropped as a practice bomb from an aircraft. These BDU-50s are about to be loaded on an F-15E. On the other hand, if the bomb is green with blue stripes, it still indicates the munition is inert but is not a practice bomb and will not be delivered by an aircraft. Instead, they may be used for load crew training purposes or static displays. These inert Mk82s are likely being used for load crew training on the F-16 in the background. Napalm can be easily identified by the red stripes. Missiles generally display two different colored bands, the quantity of each varies depending on the weapon. The AIM-9M below has the yellow stripe for the high explosive warhead and the brown stripe for the rocket motor. Between the two stripes you may notice a red and green sticker. Do not confuse those for stripes as it is the safe/arm indicator. 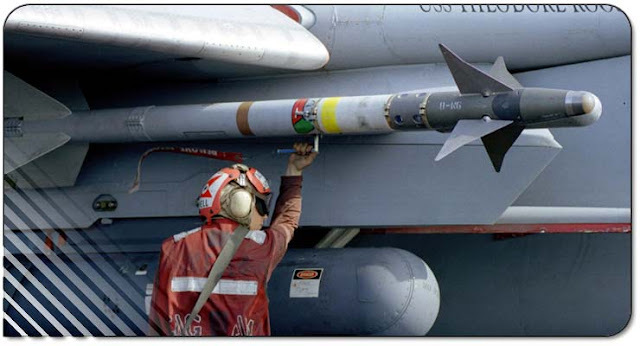 A T-handle is turned and when oriented toward the red sticker, as it is in the photo, the missile is armed. These RAF Sidewinders share the same markings except you may notice a brown stripe around the guidance and control section - look carefully between the canards and you'll see it. 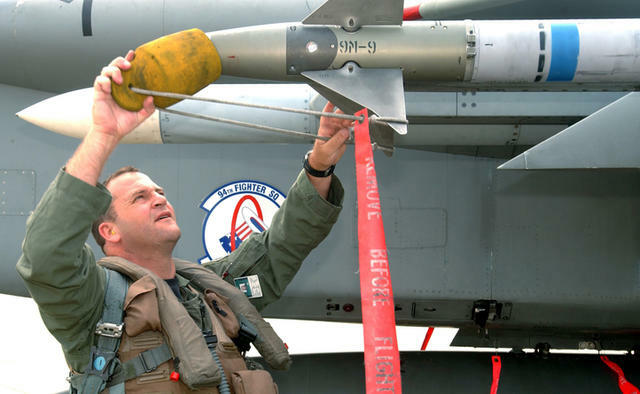 This is only common on NATO AIM-9s, I have yet to see a US example with such a marking. It is used, presumably, to indicate the seeker head is live. 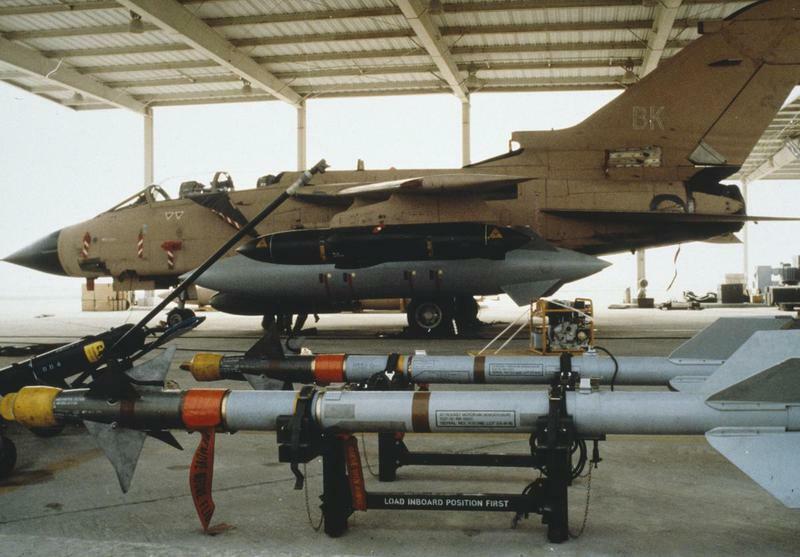 In some instances you may see black markings, especially on older versions of AIM-9s and Sparrows. 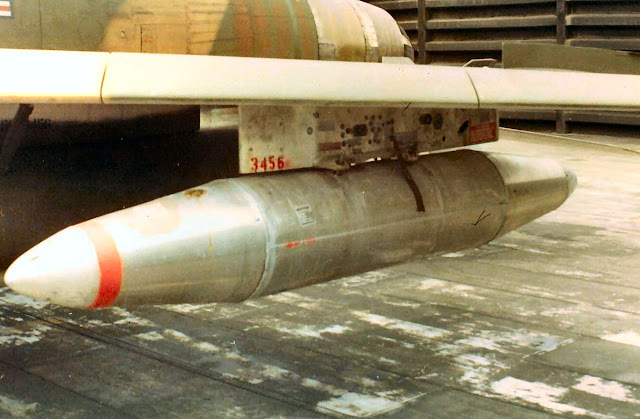 The black rings do not indicate any kind of explosive hazard and were applied around the various missile section seams. Sometimes modelers get confused, aided by faulty kit instructions, and apply only black stripes to their Sparrows, Sidewinders and Phoenixes. Black and white photos make it difficult to decipher brown from black and yellow can often be washed out. Dark blue inert stripes may appear to be black from a distance. Don't be fooled. You can see below several black rings around this Sparrow which also has the yellow ring and brown ring furthest aft. Here is another good example of the black rings on a Sparrow. Generally speaking, for missiles, a blue stripe in place of a yellow or brown one indicates the warhead or rocket motor are inert. 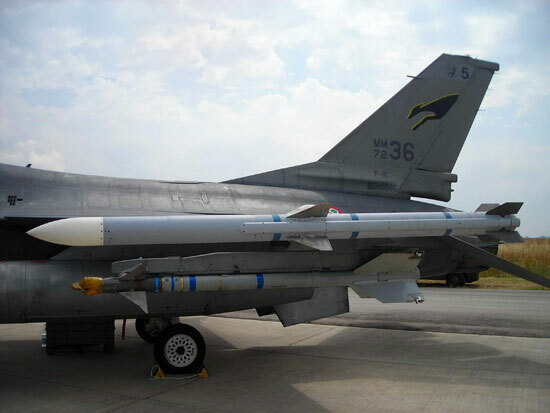 The entire AIM-120 below is inert as indicated by three blue stripes. However, though the warhead and rocket motor of the AIM-9 are inert, notice there remains a brown stripe around the guidance and control section of this Italian F-16. 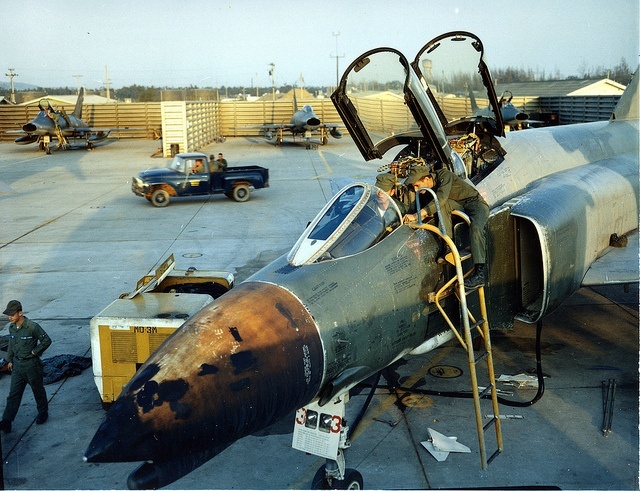 This means the pilot may use the Sidewinder to acquire targets during mock dogfights but clearly can not fire it. Conversely, US versions, called CATM-9s have a live guidance and control section but do not have the brown stripe. Bombs may also split inert and live functionality. The GBU-12 below has a blue BDU-50 and brown Computer Control Group. So the munition will guide to the target with the live seeker head but will not explode. You may also see a completely blue GBU-12 CCG. By now you should realize it will not function at all. In this case, they are used for load crew training and static display. 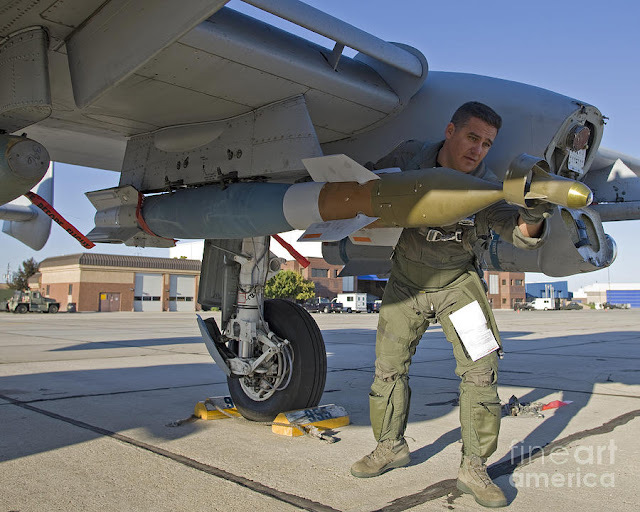 Now that you've got a basic education on ordnance markings, I hope you can see why the bombs on that A-6 at the Nats were not accurate - blue and yellow can't go together. Take your time and research your references. 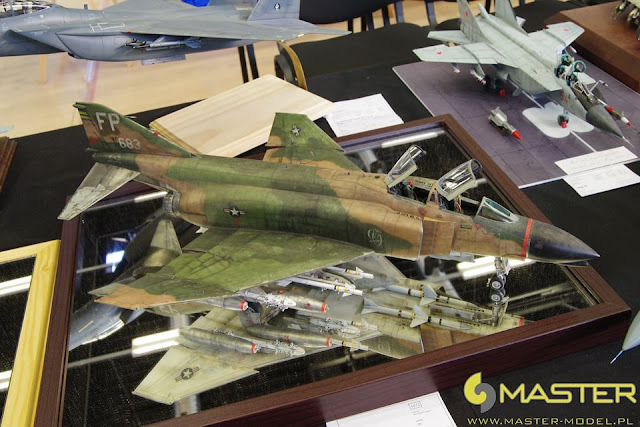 Understand that there is a particular formula for ordnance depending on if you want to display it live or inert. Certain colors may look more attractive than others but they have meaning in the real world that, in order to maintain an accurate level of modeling, must be adhered to. If I may ask where you are from it may help this conversation down the road. Keep in mind this is a US centric munitions page so I cannot comment on the practices of foreign countries and their ordnance. If you read the article you would see that I specify the difference between "practice" bombs and "inert" bombs. All over blue is "practice". Blue stripe is "inert". However, in most cases, even the "practice" bombs are "inert". 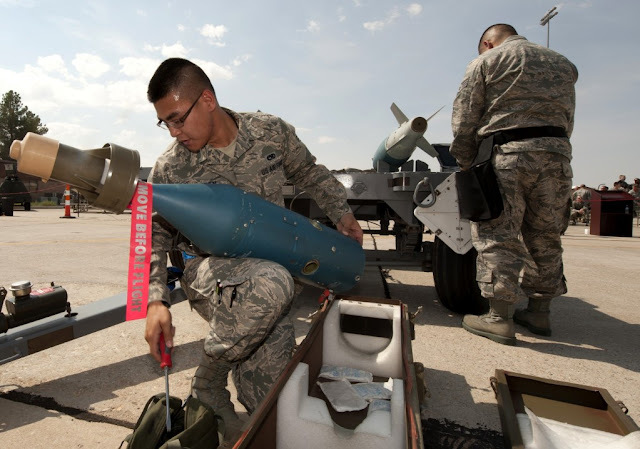 The BDU-33 practice bombs we drop with signal smoke do not have a brown stripe and I have never seen a practice bomb, especially not a 500 lb BDU-50, with a yellow stripe before. This is why I refer to them as "inert" since there is no explosive hazard. If you have photo evidence to back that up I would certainly appreciate it. Great piece Jon. Thank you for sharing your knowledge.